March 2009 – Christian Gossett’s THE RED STAR™ on sale here. 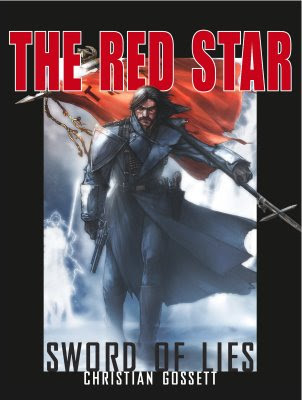 THE RED STAR TRADE PAPERBACK #4: SWORD OF LIES is now available!! The Red Star, one of the most celebrated graphic novels of the decade, is an epic mythology inspired by the art and history of the Soviet Union. Sword of Lies is the 4th graphic novel in the collection. Integrating traditionally drawn characters and computer generated environments, The Red Star is unique in its cinematic visual style. With unforgettable pencils by multiple Eisner nominee Christian Gossett and extraordinary digital painting by the world famous Weta Workshop New Zealand, this 200 page graphic novel not only continues the adventures of the Skyfurnace Konstantinov, it takes readers back to the origin story of The Red Star.